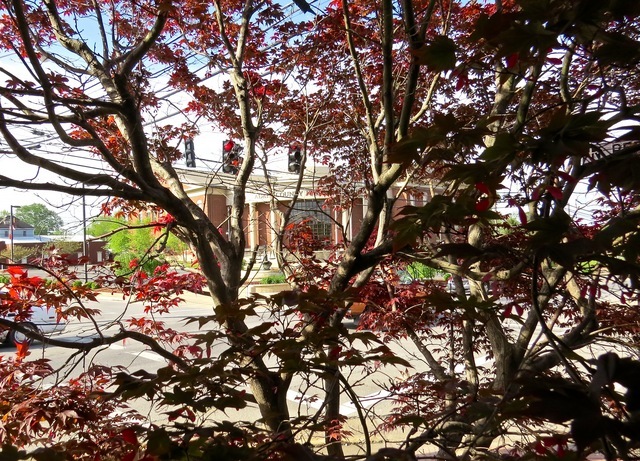 2017-04-23 - Adair Judicial Center, 201 Campbellsville Street, Columbia, KY - Photo by Linda Waggener, ColumbiaMagazine.com photo(c). There is beauty one can only see when walking Columbia. This scene was captured from the Reed Street front ramp at City Hall, before the special meeting of City Council, Thu 22 Apr 2017 - one of the shortest on record, but one which completed a significant, essential step toward developing Jim Blair Park. The process is overly complicated with Adair County's currently outmoded governance. But there is park progress, despite having so many overlapping governmental units. Now, with the City acknowledging the need to make Columbia healthier by being more walkable, there is great optimism that the community will reap the economic development and tourism rewards, and health benefits a more walkable downtown campus will bring. - EW. Clicking Read More accesses the Thursday council report.